Jumping session starts every hour so please come to GOjump Centralna 20 minutes before. You will be able to change, put on jumping socks and leave your stuff in our locker rooms with no rush. At full hour the session will start. First you will enjoy our fun warm-up, listen to safety briefing and meet our Trainers. Then GOjump will be all yours. 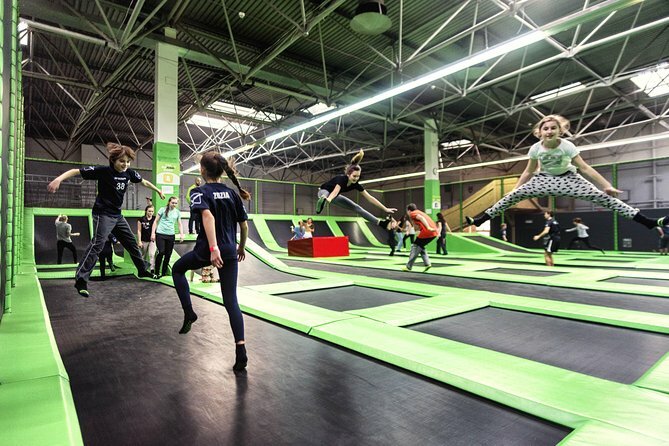 You can enjoy all of our 15 attractions: giant trampoline arena, big foam pit, stunt airbag, big "ball splash" slides, "HopKids" area, megatramp of 36sq.m., dodgeball pitch, dunk zone, GOninja obstacle course, crazy donut glider, arcade games zone and many more. After jumping you will need to recharge energy - our JumpBar invites you for some refreshments and snacks! - Don't worry if you plan to come with non-jumper! We have a cosy jump bar and arcade games zone for them. - GOjump can be enjoyed by kids over 4 y.o. Departure Time: Jumping sessions start every full hour. Jumping socks (anti-slippery) are not included in price. You can buy them at GOjump Reception counter. GOjump can be enjoyed by kids over 4 y.o.